- Prepare the rice and cool. - Chop up the dried fruits and toss with the cooled rice. Wrap and store chilled in the fridge. - Prepare the vinaigrette and store in a salad dressing bottle or small jar; store in the fridge. - Saute the garlic, onions and mushrooms. Cool and toss into the rice and dried fruit mixture. Wrap and store chilled in the fridge. - Toast walnuts, cool and store at room temp. - Combine the vinaigrette with the rice mixture and place into a serving dish. Top with fresh watercress, toasted walnuts and crumbled goat cheese. Cook the rice on the stovetop as directed or in a rice cooker/steamer. Once cooked, allow the rice to cool and set aside. To prepare the mushrooms:In a large skillet, heat the canola oil over medium-high heat. Add the garlic and onions and saute until softened. Add the mushrooms and cook, stirring occasionally, for 5 to 6 minutes, or until lightly browned. Remove from heat, drain well, and set aside. To make the vinaigrette: In a small bowl whisk together the olive oil, vinegar, shallots, cumin, thyme, and pepper and season with salt. Add the dried fruits. 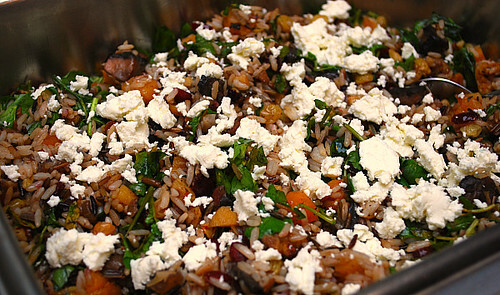 In a salad bowl, combine the cooled wild rice, cooked mushrooms, and walnuts. Toss with the vinaigrette and fruits. To serve, portion the salad onto a large platter, top with the greens, and sprinkle with the goat cheese. Did you say wild rice, walnuts, mushrooms and dried fruit amongst other goodies? I can't resist. I am about to print it for a dinner, soon. Every time, I visit, I find recipes, I can't wait to make. Thanks. My grandmother has this own version of this. And she usually puts more ingredients in it. And I find it really very delicious! It is like you had a full meal.